These are a collection of articles written for the Dimmitt’s Grove Neighborhood Association Newsletters from 2005 – 2009. The November 15th one year anniversary, of the Oscar Mandel House move from 507 E. Washington to 402 E. Grove, is quickly approaching. In the months that have ensued, since the house move, a great deal of progress has been made in the restoration of the house. Following is a summary of work completed, work in flight and work yet to do. Take into consideration the phrase “The devil is in the details” when reading the following – for every piece of major work called out, below, there are often many precursor tasks that take a significant amount of planning, time and effort. The back stairs, leading to the basement, have been rebuilt. The kitchen ceiling that was lowered during a 1930s remodel was removed to allow for electrical and plumbing work, and will be returned to its original height. The ceiling in the 1/2 bath on the first floor has also been removed and will be raised. The kitchen backsplash was removed to allow for installation of electrical outlets (the countertop and backsplash, refinish work for electrical, plumbing and heating/cooling systems remains to be done. We have some live outlets on the first floor, basement and exterior of the house, but installation of remaining outlets, switches and lights awaits plaster repair in those areas. Heating/cooling vents on the second floor also await some plaster work prior to installation. Except for a lone toilet, in the 1st floor 1/2 bath, we have none of the bath/kitchen fixtures set – you guessed it, more plaster work AND tile work. For years, the lots at 402 and 404-406 E. Grove sat vacant after decades of neglect and misuse lead to the eventual destruction of the remaining buildings, which occupied those sites. The lots eventually found a new use, as an informal neighborhood dog park. Meanwhile, over at 507 E. Washington, a house sat, slowly decaying. An architectural gem, once the pride and joy of the family that had commissioned it to be built, was enduring decades of neglect itself. Eventually the house sat alone, the solitary remaining home in the entire 500 block of Washington/Front Streets. The house sat in the shadow of Wesley United Methodist Church and was surrounded by a sea of black asphalt – enveloped by darkness – seemingly a reflection of the “mood” of the house – lonely, deep, dark depression – and a sign of times to come. Long story short, and a part of the story that Dawn and I have shared with very few people, is that after 2 1/2 months of very concentrated effort to determine if moving this house, that we had come to love and saw so much potential in, was economically and logistically feasible, we were preparing ourselves for the inevitable – despite our best efforts, it just wasn’t going to happen. We left town on October 2nd for a long planned weekend in Minneapolis-St. Paul. We had planned to notify the church of our decision the following week, with another in a series of go/no go house move deadlines approaching. That weekend we spent a lot of time on and around Summit Avenue – for those of you who have never visited Minneapolis-St. Paul, Summit Avenue is a several mile long tree-lined residential street housing the turn of the century mansions of the city’s elite. Seeing so many beautifully preserved homes brought smiles to our faces, but at the same time broke our hearts, because we knew that that dilapidated but still beautiful house on Washington Street was destined for the wrecking ball, not for restoration to its former glory. That weekend, and Summit Avenue represented a turning point. There were hours of serious discussion and I think a few tears. Looking back now it’s all kind of a blur. In the end we couldn’t bear the thought of losing this house that we loved – its incredible architectural features, its interior evolutionary changes pristinely preserved, its rich history. We knew that we would always regret not having done everything within our power to preservethe house. Desperate days ensued but the house did move and is currently in the process of being restored. A few weeks ago the lots were hydro seeded, four pear trees were planted along Gridley St., the original limestone walkway, walkway steps and ornamental standards were permanently set, and the city sidewalk along Grove St. was replaced. These landscape changes effectively anchored the house – making it appear as if it has always been here. The synthetic slate roof has been installed, complete with copper snow guards and ornamental cresting. Contractor Gary Calhoon fabricated the cresting and finials to duplicate what was originally on the house, using early photos as a guide. Repair work on the turret roof, additional flashing installation, roofing of the front porch, and adding ridge vents, cresting and finials to the rest of the roof ridges remains to be done. All gutter work is complete with the exception of copper half round gutters on the back east side of the house and box gutters on the front porch. The beautiful black drainage tile, that you see, will continue to serve as the gutter downspouts until all exterior wood repair is complete and the house is painted. Cedar sidewall shingle replacement is nearly complete with only areas around the dusting porches still requiring repair. The dusting porches have received extensive restoration. The side dusting porch has been completely rebuilt and the front dusting porch has seen removal of the weatherproof coating on the floor, replacement of rotted support beams, rework of the drainage system, installation of new metal flooring, application of new interior cedar sidewall shingles and a new top cap. Both dusting porches will receive a new weatherproof coating on their floors and at some point we will add railing and a spandrel on the front dusting porch to restore it to its 1894 appearance. Exterior painting on the upper stories of the west side of the house is nearing completion. Paint colors were selected to mimic what was on the house originally. We looked at protected areas of the house and bottom layers of paint while scraping to determine the original color palette and then selected the closest matches to period paint colors, using historical paint reference books as guides. Our focus will be on priming any remaining new wood and getting a top coat paint on the 3rd story east side and back of the house, as weather permits. We’ve been taking advantage of the extremely warm and dry Fall weather, spending the majority of our time on activities on the exterior of the house. Subsequently, there hasn’t been much progress on the interior of the house. The house is currently cleaner than it has probably been for the last 60+ years. The 2nd floor has received intensive cleaning from floor to ceiling, with several hours being spent cleaning each room – ceilings and walls scrubbed with diluted TSP, wood work washed down using Ivory soap, floors were vacuumed many times over and then damp mopped. The 1st floor received slightly less attention as we prepared for the October 22nd Restoration Tour. The house won’t be passing “the white glove test” anytime soon but you can walk across the floors without leaving footprints in the dust, and it looks, smells and feels good. With cooler temperatures approaching we recently had natural gas service activated, had the thermostat for the basement furnace installed, and started the hot water heater. Completing restoration and installation of the basement windows is high on our work priority list. We’re usually so intent on looking ahead at tasks yet to be completed that we don’t often take the time to think about or fully appreciate all that has been accomplished with the house’s restoration. On November 15th we’ll be quietly celebrating the house’s move date anniversary – reflecting on what was, what could have been and what has been accomplished – and of course we will be dreaming about what will be………. Just because Dawn and I have been MIA, doesn’t mean that restoration work has come to a standstill. Contractor Gary Calhoon and his crew have completed several exterior restoration tasks, in the last few weeks. The original slate on the turret has been preserved, but the turret roof required some repair after installation of the copper valleys surrounding the turret. This roof repair has been completed as has the installation of the front porch roof. All remaining roof ridge vents, flashing, ridge cresting and finials have been installed. The newest finials are a pair of post and balls installed on the highest roof ridge, fabricated to duplicate those originally on the house. The large finial on top of the turret has been removed in order to clean, repair and repaint it. Although not readily visible from the ground, the finial had several holes in it, requiring repair and application of preservation materials in order to prevent further deterioration. The finial was also missing several 1/2 spheres around its bottom edge, which have been replaced. The box gutters on the front porch have been rebuilt. Dawn and I were able to take advantage of a couple of unseasonably warm days, the week prior to Christmas, and got the fascia boards on the rear east section of the house painted, allowing for installation of the half round copper gutters. Cedar sidewall shingle replacement is complete except for that required on the side dusting porch. Crown molding for the bottom edge of the side dusting porch is being milled and must be installed before the cedar shingles are installed on the dusting porch. Remaining exterior wood repair is now reserved mainly to first story clapboards and the water table. Exterior painting on the second and third stories on the west side of the house is complete. All new wood on the remainder of the house has received at least a prime coat of paint. The north side of the house has received its first top coat of paint on the cedar shingles. During our holiday we took time to decorate the house for Christmas. With the enthusiastic help of our dogs, Lilo and Koa, we decorated a tree in the first floor reception hall – visible through those curved windows in the front east corner of the house. We also put up a feather tree in the front parlor window and wreathes on the front doors. This was only the house’s second Christmas. Oscar Mandel was Jewish, as was his grandson, Oscar Cohn, so Hanukah had previously been celebrated in the house. This year the house saw the lighting of the Christmas tree, instead of the lighting of the menorah – just one more change for the house – it seemed happy, just to be a home for one more holiday. On April 29th, Dawn and I traveled to Nashville, TN, where I ran the Country Music Marathon (26.2 miles) and Dawn ran the 1/2 Marathon (13.1 miles). The time and energy that the house move and restoration has required, necessitated a hiatus from running, until this past December, at which time we reintegrated running back into our lives. Running, especially distance running where you may be running for hours at a time, provides plenty of time for thinking – thinking about anything, everything, nothing. With so much work left to do on the house, during runs these days, we often think of the million and one things that we should be doing instead of running. Work on the exterior of the house has focused primarily on replacement of the box sills located at the rear and rear east corner of the house. Termite infestation in these areas, when the house sat on Washington Street, required total replacement of the sills to ensure future structural integrity. With the box sills replaced, the water table (which covers the sills) can be installed and the clapboards on the 1st floor can be repaired. The original water table was removed from the house prior to the move, and portions of it will be used (after some paint scraping), in the construction of the new water table. Replacement corbels for the east side of the house and the front porch have been cut and are awaiting installation. Flashings on the interior of the 2nd floor dusting porches, and on the top reveal of the main staircase window have been installed. scheduled. Plaster repair around switch and receptacle boxes on the 1st floor is underway. While much of the plaster in the house can be saved, there are sections of walls and ceilings where the plaster keys have pulled away from the lath and cannot be adequately reattached. We’re in the process of removing plaster in those areas and securing the remaining plaster. The house surprised us a few weeks ago when the vibrations from repeated thunder claps caused the ceiling over the main staircase to fall – not our preferred method of demolition but it was quick and effective. started and hostas and other shade loving plants will be placed in the parkway area to the east of the driveway entrance. A rock bed comprised of slate chips (from the original slate roof) has been created around the base of the turret to catch rain runoff in that area, and ferns have been planted in the bed. In the next few weeks the exterior wood repair should be completed. We don’t anticipate resuming exterior painting to any great extent, until late this summer. We consider painting and landscaping to be two of the most enjoyable tasks related to the house. Both provide instant gratification and you can break the larger task into manageable chunks, making recognizable progress in a relatively short timeframe. When you see us painting or digging in the dirt, know that we’re rewarding ourselves for progress on the interior of the house. Moving a house is not a preferred means of preservation – the house is not, nor will it ever be the house that it was – it has a new foundation – it sits differently on the foundation being rudely forced to regain a rigid posture on the new, level foundation, after having had 110 years to settle in to its original foundation. Differences between the old and new foundations present constant challenges. Plaster has cracked as floors have leveled or the house has settled. Doors that didn’t swing, now do and those that did swing now don’t. Most vexing is trying to retrofit original elements of the house to work with the new foundation. A fraction of an inch difference between old and new foundations means that things no longer fit as originally intended. We encountered challenges with the new foundation when relaying the exterior facing brick, rebuilding the stone front porch and reinstalling the limestone window sills. The recent installation of the “new” water table and the reinstallation of the original basement windows proved to be no less challenging. The original pitch of the water table had to change, because the facing brick now juts out beyond the box sill in some areas. As a result, most of the original water table boards that we had salvaged pre-move could not be reused. Basement window openings turned out to be of slightly different sizes in the new versus the old foundations, requiring that each window (all 13 of them) be resized to fit the new opening. We have completed framing for the front porch. The floor boards aren’t down yet, but we’re able to walk up the front steps, across plywood and through the front door – something that we haven’t done since the house sat on Washington Street. Remaining exterior wood repair consists mainly of replacing/repairing 1st floor clapboards. Assessment of the plaster on the 2nd floor of the house led to the decision to have all 2nd floor ceilings replastered. We removed 3 of the 5 bedroom ceilings, as well as the hallway ceiling, and the ceiling and walls in a small bathroom area. The ceiling over the main staircase/2nd floor landing had previously come down during a thunderstorm. All of these areas have been finished with 3 coats of plaster. Two other bedrooms received fresh finish coats of plaster. There are still some wall cracks to contend with, but nothing as daunting as those ceilings. The second floor is now ready for installation of heating/cooling system ceiling diffusers and permanent ceiling light fixtures (as soon as they are cleaned and rewired). Phone/cable/data hookups have been installed throughout the house. First floor switches and temporary porcelain keyless light fixtures will be installed as soon as plaster repair around switches is complete. Most of the original lights on the first floor are wall sconces. The sconces will not be installed until the wall fabrics in the parlor and dining room are reapplied – a task that is on the bottom of our restoration “to do” list. Our focus in the next few weeks will be on finish electrical and plumbing work and remaining major plaster repair in the kitchen/pantry and back hallway areas of the1st floor. run in the house to view the garden from the parlor and west-side bedroom windows – it makes me smile every time. 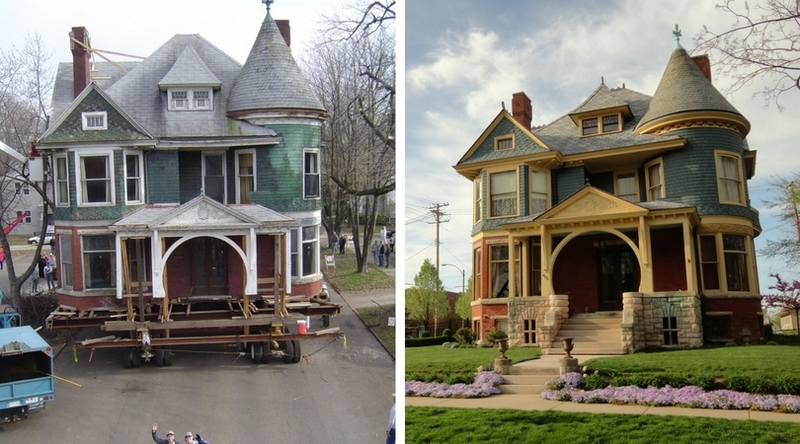 the house move and house restoration to the same group. Shortly thereafter we were contacted by an editor of This Old House Magazine, regarding the possibility of featuring the house restoration story in a future issue of the magazine. Since we’re still in the early stages of restoration work, the magazine would like to re-evaluate the story potential for publication, at a later date (I figure at the current rate of progress you might want to look for that story to be published in say, the year 2010). And paint we have. Since late August we’ve completed painting the back of the house and most of the east side of the house. The side dusting porch has been primed and the turret has been scraped, sanded and puttied. Prepping the turret took longer than expected due to the work involved in stripping the ornamental metal work at the roofline. Provided the weather cooperates, we’ll meet our paint goal for the year, which was to complete painting the upper stories of the house. Other significant work completed on the exterior of the house includes re-installation of the turret finial, application of a preservation product on the dusting porch floors and installation of a fountain in the center of the parterre. The fountain and landscape lights, in the parterre, have been permanently wired, with power to the fountain controlled by a switch installed in the parlor. Sections of the yard were re-graded and reseeded, a new perennial bed has been created, and 4 Ruby Spice Clethra were planted in the front yard, along the east lot line (the first of several varieties of flowering shrubs that we plan to plant along this border). That pile of dirt in the back yard is actually the start of a berm, which will be behind the pond. Remarkably, we came into possession of photos taken during the installation of the original pond, at the house’s Washington St. site. We will be recreating the pond, using stone from that we salvaged from the original pond, prior to the house move. The focus of interior work has been primarily on completing work on the mechanicals. The HVAC ceiling diffusers on the 2nd story were installed – only to be uninstalled when fresh plaster ceilings were primed. All work on the HVAC systems is complete. A change in plumbers resulted in some plumbing rework, but all of the plumbing rough in is now complete (at least until we decide to change something). Sinks and toilets can be set once plaster and tile repair is done. The majority of the electrical work is done, with 1st floor switches and temporary keyless porcelain fixtures being installed. Several can lights were installed in kitchen ceiling. Original switch and outlet plates have been reused throughout the house and reproduction push-button switches have been installed in many rooms. floor drainpipe, making excavation for the footing impossible. We ended up placing a 500lb-plus pier pad on top of the concrete basement floor. We’re currently working on creative ideas to integrate the 2 1/2’ X 2 1/2’ X 8” pier pad and post into the basement floor plan – why would we expect anything to be easy with this project? With the structural support issue resolved, we’re ready to continue with plaster repair on the first floor, where a hallway ceiling outside of the kitchen will be replaced and the kitchen, pantry, ½ bath and entry will all receive extensive plaster repair. Other major interior work that we hope to complete during the winter months includes tile repair/installation in the 2nd floor bathrooms, tile repair/installation in the kitchen and installation of ceilings in the kitchen and ½ bath. Mid-November through the first week of January is a busy time for most people – holiday parties, family gatherings, shopping for Christmas gifts, decorating the home for the holidays – it’s a blur of activity. This holiday season we were busier than usual. In a addition to all of the aforementioned activities, we organized an afternoon of rock climbing with several friends, just before Thanksgiving, and hosted a large dinner party, at the house, afterwards. Two weekends later we braved the blizzard and drove to Bloomington (Indiana), where I ran a trail marathon. Oh yeah, we managed to get some work done on the house too! The weather held and we met our exterior painting goal, of completing the upper stories of the house by year end. We painted steadily through November (Thanksgiving Day was spent on the scaffolding) and finished up in mid-December. The 4 color paint scheme of the house is now visible. Two windows on the east side of the house wear the dark brown sash color, and the deep red color that will be used on the 1st story clapboards, has made an appearance in the detail of the ornamental metal work at the roofline of the turret. The detail of the ornamental metal work is amazing – even now, with all of those layers of old paint stripped away, the detail cannot be fully appreciated from the ground – up close you can see that there are delicate bows connected by ribbons decorated with leaves and flowers. When we resume painting in the Spring/Summer we’ll be working on the area above the front porch and then start working our way around the 1st floor of the house. There is still a lot of work left on the interior of the house, but I think we’re beginning to see the light at the end of the tunnel – last week we spent time making a final decision on the kitchen countertop – after 2+ years of thinking about what we’re going to do with the kitchen we’re finally to the point where we need to make decisions! We’re looking forward to a little post holiday R&R this weekend -we’re heading to Phoenix where I’ll be running a marathon and Dawn will be running a ½ marathon – after running we’ll be flying to Santa Fe via Albuquerque, to ski. Then it’s back to work. Areas where we had previously removed plaster and installed lath (1st floor hallway ceiling and front entry) have been plastered, as has part of a 2nd floor bedroom wall (a foundation settlement casualty). a new globe). Of the 36 lights, we are moving only 3 from their original locations. All 36 light fixtures have required extensive cleaning and/or stripping, and all of the fixtures have had to be rewired. In addition to replacing the lights that were not usable, we’ve added a few lights in areas where essential light was lacking (closets, entrances, stairs, a bath, the kitchen). All light fixture additions involved hours and hours of internet searching/salvage yard hunting to find fixtures that were 1) period appropriate 2) integrated well with existing fixtures 3) fit in the space allowed and 4) Dawn and I both liked – I can’t fathom how long it would have taken us to choose every light fixture in the house. The first round of ceiling fixtures was installed last week. All remaining outlets/switches were also installed, as were the doorbells, dining room servant’s bell and the rope and puck lights in the kitchen. The attic windows have been restored (sashes repaired, missing/broken glass replaced, re-glazed, sashes primed and painted, hardware cleaned) and reinstalled. Mismatched floor tile in the master bath has been removed. Adhesive removal on the walls of 2 bedrooms and the 2nd floor staircase landing continues. We’re in the midst of stripping woodwork in the kitchen and in an upstairs bath. Plaster repair of wall cracks throughout the house is ongoing. The next few weeks will be spent on restoration/installation of the remaining light fixtures, plaster repair, refinishing the kitchen cabinets and woodwork, interior painting and bathroom tile repair. limited financial resources, no fantastic network of building, governmental or banking resources to draw upon. So why did we move the house? The answer came to me with unbelievable clarity – Because we thought we could. I thought we could move the house, because just a few months prior (September of 2003), I had crossed the finish line at Ironman Wisconsin. That accomplishment was so empowering that I didn’t think that any challenge was too great or any obstacle insurmountable. Dawn was with me in Madison, that September day, living the Ironman experience with me, as she had for several months leading up to Ironman day. Truth be told, I wouldn’t have made it to the Ironman starting line, let alone the finish line, had it not been for her. She managed my training schedule, handled travel logistics for races, and did tremendous amounts of research on everything related to triathlon. She gave me endless support that summer, along with heavy doses of much needed tough love on days that I lacked the motivation to get out the door to swim, bike or run. She believed in me and made the fulfillment of my Ironman dream her quest. When I crossed that finish line in Madison we were both left believing that anything was possible – even moving a house. Ironman Wisconsin 2003 was the last triathlon that I would participate in for 3 ½ years, as I focused my energy on an entirely different endurance activity – moving and restoring a house. Ironically, it is “that house” that has brought me back to triathlon and pursuit of another Ironman finish. Dawn and I have gradually been reclaiming our pre-house move lives, making time for activities that we enjoyed before “the house” consumed all of our time and energy. We started going to the gym again; we committed to a marathon/1/2 marathon and started running again. When I began riding the bike again, last summer, with a friend who was pursuing her Ironman dream, I realized how much I missed triathlon. It wasn’t just triathlon that I missed; it was the challenge of the Ironman – the mental and physical challenges encountered not only on Ironman day, but during months of training in preparation for the event. Most of all, I missed that feeling of accomplishment that I had when I crossed the finish line in Madison. Our house project, while full of mental and physical challenges, was not hitting the mark in terms of accomplishment, for either Dawn or myself. After 2 years of “housework”, we seemed miles away from any perceived finish line with our restoration project – we needed to find a way to recharge – rebuild momentum for the next surge of restoration work. And, the answer seemed to be the Ironman. You might find it surprising, but Ironman events are extremely popular, with event registration generally closing within 2-3 hours of opening – with registration occurring 12 months prior to the event. So, early last September I committed mentally and financially to Ironman Wisconsin. With a definitive event date goal and knowing the time commitment involved with training, come spring, Dawn and I knew that we’d have to make the most of our time during the Fall/Winter, where the house was concerned, and we did – momentum regained. Tackling an Ironman while in the midst of such a huge project might seem like an extreme way to find rejuvenation… but its not… when you think that anything is possible. I couldn’t understand then, and I suppose I never will understand why, there weren’t other people (lots of other people) willing to commit to the preservation of this house. The very first time I walked through the front door I thought that the house was pretty amazing – for me, it was definitely love at first sight. While not exactly in pristine condition when we first saw it, Greg Koos, Executive Director of the McLean County Museum of History, had described the house as “near museum quality”, in a 2004 Pantagraph article. In that same interview, Koos stated that the quality of craftsmanship and materials utilized in the construction of the house set it apart from most other homes EVER constructed in McLean County. Built in 1894, the house remained largely untouched after a 1909 “remodel” of the 1st floor, and a subsequent “update” of the kitchen and sleeping porch areas and the addition of a ½ bath, in the early 1930’s. The house retained virtually all elements of its “evolution” – woodwork, cabinetry, windows, doors, hardware, lighting fixtures, flooring, special plaster finishes, tile, sinks, tubs, faucets and even the kitchen stove! Time had truly stood still in this house. With the exception of a few bad repairs, some sloppy painting and lack of routine maintenance, that led to water damage and plaster destruction in a few areas, very little had changed in the interior of the house after the early 1930’s. While an old house lover’s dream in terms of remaining in such an “intact” state, the house also brought with it a high level of responsibility – the responsibility to be good custodians and faithful preservationists. We have embraced that responsibility, changing relatively little, choosing instead to restore and reuse whenever possible. For example, plaster is repaired instead of replaced with drywall, lighting fixtures are cleaned/rewired and reused, windows are restored instead of replaced, the 1932 Kohler kitchen sink has been re-porcelained and will be returned to use as will the circa 1932 Magic Chef stove, even the switch plates and outlet covers have been restored and reused. Despite the fact that we had repeatedly expressed interest in reacquiring these items for the house, the Cohn family recently, without contacting us, sold the stained glass panels to a 3rd party. Luckily we were notified, by an interested party that the estate of the family member in possession of the items from the house was in the process of being liquidated. We were able to locate the stained glass and secure its purchase (at 5 times the cost for which it was sold) before it was resold on the open market. We are currently in the process of having the glass restored and refitted into its original window frames. We are very happy to be returning the stained glass to the house, but that happiness is tempered with a great deal of disappointment – disappointment that the glass was ever allowed to be taken from the house, disappointment that the Cohn family while expressing interest in the preservation of the house is not facilitating the process, and most of all disappointment in knowing that it is highly unlikely that the front door and dining room light fixture will ever be returned to the house. Since our last update, plaster repair and painting has been completed in the entry, entry closet and ½ bath. Plaster repair in the pantry and 1st floor hallway is nearly complete. Backer board has been installed on the kitchen backsplash area and we’re currently working on stripping and refinishing the upper kitchen cabinets as well as the window frames above the kitchen sink, all in preparation for the installation of the soapstone countertop. On the exterior of the house, light blocks have been installed for the back door and side porch lights, and the final replacement corbels have been installed on the front porch. While it was still warm outside we worked for several days on an underground drainage system that the house’s downspouts will empty into. Once that project was complete we had the remaining sections of copper downspouts installed – no more black plastic corrugated pipe snaking through the yard! You can’t move a house without drawing people’s attention. Houses get moved everyday, yet even if you’ve had the chance to see a house moved off of its foundation and relocated, blocks, even miles away, you’d probably jump at the chance to see this miraculous feat over and over again. House moving is just one of those hard to believe it until you’ve seen it kind of things – and even after you’ve seen it, its still kind of hard to believe. Our house has a tremendous fan base largely due to the fact that it moved – that’s not something that people get a chance to see everyday and the concept is fascinating to people. A subset of that fan base are the people who are interested in the house and its history – the fact that the house moved is of secondary importance to them – they are the people who are interested in the preservation of architecture – the people who understand the importance of the past and how it shapes our future. The diehards in this group begrudged the fact that the house had to be moved, seeing the move as a necessary evil, a means to an end – move the house or lose it forever. Moving the house could potentially compromise the structural integrity of the house and the original design of the house would be altered with the construction of a new foundation. The house’s new location would require the house to be rotated 180 degrees from its original placement – and it is obvious that the architecht’s original design took into account the spatial orientation of the house – dining room windows were designed to capture the warmth of the afternoon sun (this room now catches only the early morning sun) and the parlor, the primary room for evening entertaining and family gathering was originally designed with an northeastern exposure, ensuring protection from the cold winter winds from the west (with its current southwestern exposure, the parlor is now one of the coldest rooms in the house). Moving the house also meant moving its history – effectively relocating the lives of the people who had lived in and visited the house, or had their lives touched by these people – moving the house meant changing the fabric of the original landscape. If you’re a fan of the television show Journeyman, you’ll understand the far reaching effects that this blip in history could have. The highest form of preservation would have meant leaving the house situated on its lot at 507 E. Washington….but that wasn’t an option, and saving the house meant moving it. People in our community have formed an attachment to the house – it is, after all, a feel good story – the house was saved, the beauty of its architecture preserved for future generations, a piece of local history remains intact etc. Even if history and preservation aren’t “your thing”, it’s hard not to hold a certain fascination for the fact that this massive house was moved. I think part of people’s attachment to the house is based on the knowledge, that in today’s society, the positive outcome of the house’s story is all too rare – the house represents a victory, albeit a small one, for preservation over progress. The number of remaining structures, built in our community pre-1920, has been decimated over time. These numbers continue to dwindle as several old houses have either been razed in the last year, or are slated for demolition as the result of community development efforts (specifically the construction of new Walgreen’s locations). Dawn and I are probably overly sensitive when it comes to the destruction of old houses, since we have a house that came very close to becoming landfill. I’m particularly affected by the news that 404 E. Washington, a house in Dimmitt Grove’s backyard, was recently slated for demolition (reason unknown but I’m guessing it’s related to the development of the Coachman Motel property). We can see this house out of our back windows on Grove Street, the Mandel’s would have been able to see this house from their front yard in the 500 block of E. Washington, Oscar Mandel would have walked by this house every day on his way to work – saddest of all, this is the last remaining house in the 400 and 500 blocks of E. Washington Street. The house gives people hope – hope that people will attempt to find alternative uses for our older structures. A short first floor hallway proved to be a challenge, as paint had to be stripped off of the old plaster before plaster repairs could be made. Incompatibility between early paint and newer paint has resulted in peeling paint in several areas of the house, with the hallway, back stairway and 2nd floor hallway being the worst. We’ll have to strip the paint off of the walls in all of these areas before plaster repairs can be made, and the walls can receive fresh coats of paint. On the upside, we’ve been able to uncover the paint color history of the hallway, which has been interesting – remarkably we selected 2 colors for the hallway that are very similar to colors that had previously been used, and our paint selections were made before we started the stripping process. We’ve completed stripping paint and plaster repair in the hallway, and also made some baseboard repairs. This area has been freshly painted. We’ve completed stripping the woodwork in a small bathroom area on the 2nd floor – we call it the pass-thru bath since it contains nothing but a sink and you have to pass through it to get to/from a bedroom and the bathroom. The woodwork in this room had to be completely stripped, before repainting, because of the afore mentioned paint incompatibility problem. Plaster repair and painting has been completed in this room. The hardwood floor has been chemically stripped, sanded an refinished. Once the massive sink, original to the space, is reinstalled, the room will be complete. What we’ve found to work has been multiple rounds (3) of stripper application and removal followed by through cleaning with naphtha and lacquer thinner. After 24 hours of dry time, a fresh coat of shellac is applied (the shellac actually pulls the paint out of the wood grain). This process is done 3 times. On the 3rd pass, instead of re-shellacking, the wood is sanded in preparation for stain. We’re using a gel stain since gel stains tend to sit on the wood instead of absorb into it, providing maximum concealment of any remaining green paint. 3 coats of gel stain are applied, followed by 3 coats of a protective topcoat. It’s been a very labor intensive and time consuming task – so far, the results have been great – the cabinets are beautiful, I don’t know why they were ever painted. We have the upper cabinet boxes and doors completed. The windows above the sink are also complete. We had the soapstone counter top installed the first week of January – it looks great with the cabinets and the reconditioned 1932 Kohler sink – we can’t wait to get the tile back splash and wall-mount faucet installed. We had to reinstall a large section of kitchen baseboard after it was removed in an attempt to correct a floor settlement problem. We’ve started plaster repair of the kitchen walls, which we’ll want to paint before installing the tin ceiling, but painting won’t happen until the rest of the woodwork in the room is completed – work in the kitchen will likely be ongoing for quite some time. We have removed 2 additional windows for restoration. Removal of windows in the dead of winter is not optimal, but air infiltration with plywood up has actually been less than when the windows were in place – that’s how bad the windows were. 2 windows have been fully restored and reinstalled – those are the 2 stained glass panels that we recently re-acquired for the house. The panels have been up 2 ½ months and I still stop to look at them every time I walk by the main staircase – they truly are spectacular. A substantial amount of work has been done in the 2nd floor master bath. All woodwork (3 door casings, 1 window casing, a mirror frame and a transom) and door (3) paint (at least 4 coats) was stripped, sloppy drywall repairs in the ceiling and one wall were torn out and redone, and plaster repair was done on the remaining walls. Ceiling, walls and woodwork received fresh paint. Door and transom hardware and retro towel bar, tp holder and toothbrush holder have been cleaned. Since the majority of the floor and wall tile are in good shape we decided to preserve/repair (like we always do….are we stupid or what?) Copious amounts of mortar and caulk, remnants of previous repair attempts, was carefully removed from the subway wall tile with a razor blade. A large area of floor hex tile was removed around the toilet – yes, you guessed it, another poor repair attempt. The hex tile used for the old repair were poorly laid and weren’t even the same size as the original. After we tried to find the correct size hexes, for our repair work, we had a pretty good idea why the wrong size hex tile was used previously – 1 ¼ inch unglazed hexes are not widely available – we had some made. Before floor tile repairs could be made a lot of prep work had to be done…. mortar had to be cleaned off of the hexes that had been salvaged and would be reused, holes in the old mortar base, created when plumbing in the room was reworked, had to be filled, old mortar had to be ground down, mortar grout lines where new tile would meet old had to be Dremeled out, and radiator pipes had to be removed. All of the radiators in the house had been removed prior to the house move (we’re not sure why—we would have liked to have kept them). The radiators had been cut out, with several inches of pipe left sticking out of many of the upstairs floors. We’ve been pondering how to remove these pipes and repair the holes where the pipes were, for 4+ years. Removing floor boards wasn’t an option in the bathroom where we were looking at pipes imbedded in several inches of mortar. We finally arrived at using a grinder to cut the pipes as close to the tile floor as possible and then used a Dremel tool with a small metal cutting wheel (actually lots of them) to cut from inside of the pipe….hours later the pipes were cut to the desired level. The pipes were corked and leveler was applied to create a base for the new tile. The floor tile will be repaired by the time you read this. Our tile installer is laying the new hex tile one piece at a time….exactly how the original floor would have been laid. Once the floor is repaired, the toilet can be set and tub faucet and shower surround installed. Prior to the house moving, most of the light fixtures in the house were taken down, catalogued and boxed up. Over the course of the last 4 years we’ve been working on restoring these light fixtures – cleaning them, having them rewired and reinstalling them in their original locations. We’ve finally finished cleaning and rewiring the last of these 36 fixtures. Some of the fixtures required only soap and water and a lot of elbow grease, but others had been painted over and had to be fully disassembled and stripped. Countless hours were spent in the process of restoring these fixtures and finding appropriate mounting hardware when it was missing (we use only slotted screws in the house where screws are visible). The latest light installation included brass pan ceiling fixtures in the bedrooms, a deco globed ceiling fixture in the bathroom, and an unusual deco pendant in the pantry.